Any little red or yellow flags on a report? Here's how to diagnose 'em! What are Violations and Notes? 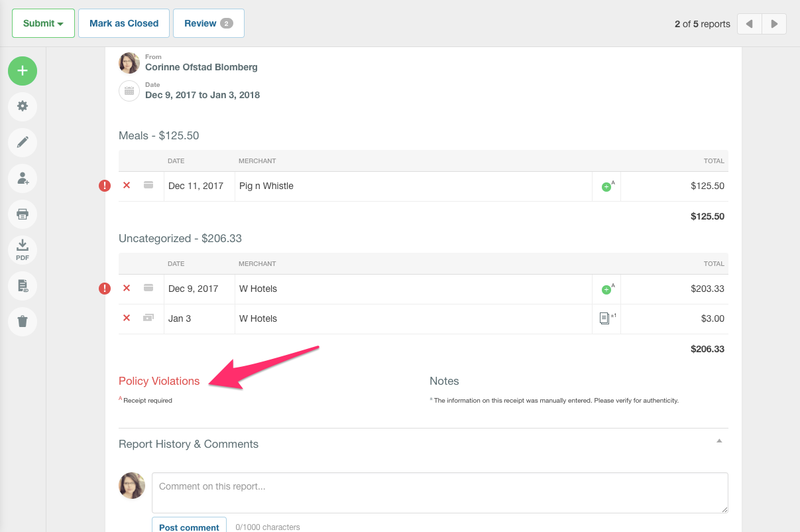 How do I know if I have a violation on my report? Sometimes your report will show violations or notes, though you still need to submit it. 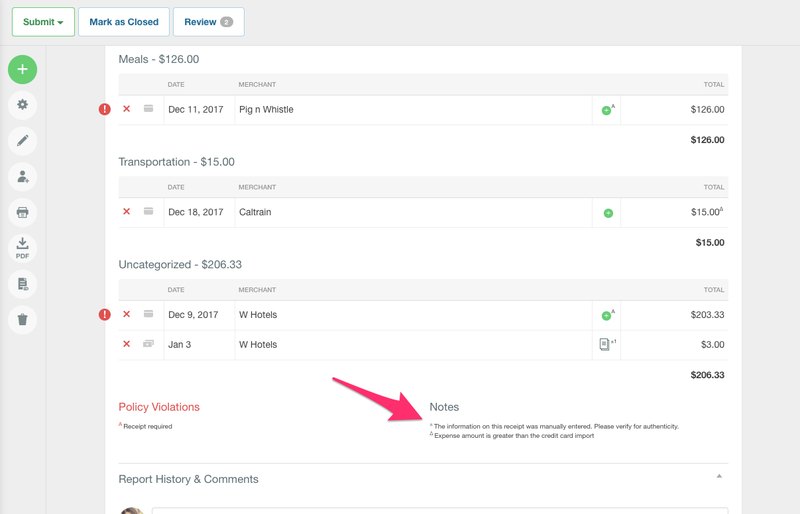 Violations are displayed with red exclamation points to the left of the expense (or are highlighted red on your edit screen) and go against the rules that have been set up for the policy. Violations are not available on Individual Policies, and are only available on Control Policies. A note is a yellow warning symbol that is informational, but may not necessarily need any corrective action. These are items that Concierge thinks may need brought to the submitter's or approver's attention, even though it isn't necessarily breaking any rules. Notes are available on Individual Policies, and on Group (Collect and Control) Policies. These notifications are important, because they will be highlight in the Guided Review process for the submitter to review prior to submission, and the approver to make clear decisions to reject or review expenses. The yellow Concierge Next Step banner (below) will display at the top of a report that has any violations. Specifically, this report is using Scheduled Submit, which means it will be automatically submitted at the end of the designated reporting period as long as the violations are corrected. Want to go through the violations one by one? Click the "Review" button in blue there at the top to be walked through each one with Guided Review. To adjust report or policy rules so that some expenses do not generate violations, go to Settings > Policies > Group > [Policy Name] to make any edits to policy settings that need to be followed, using the menu on the left hand side of the screen. A domain admin can also strictly enforce policy rules so reports with violations cannot be submitted at all until these corrections are made. To do this, head to Settings > Domain Control > [Domain Name] > Groups > click the Edit button next to the group of domain members you'd like to restrict, then check the box for the rule "Strictly Enforce Expense Policy Rules". (See Hard stop violations at the end of this page for more information). Violations: Violations are items that have gone directly against the policy that has been set by the policy admin(s). These are displayed in red. Notes: These surface when something doesn't quite pass Concierge's audit process. The goal is to draw attention to specific expenses, but there may be no specific call to action. Think of these as a heads up to be sure the expense is filed correctly. These are also displayed in yellow since they could potentially need attention. Violation signals are red exclamation marks. These are errors that need to be addressed before a report is submitted. Hovering over the "!" will display a description of the violation. If a red "!" is not displayed for any reason next to an individual expense (for example, if the report has been approved already but you are not able to export to an accounting system because of a "violation" on the report), you can always check for Policy Violations at the bottom of the report for any violations that still exist, along with the superscript notation that can be matched with that expense. All tag levels required - Multiple levels of tags are being used on the policy but not all levels of tags have yet been selected for the expense. Category out of policy - The policy you are using to create the report doesn’t have the category selected for that expense. Either change the policy to the correct one or click on the expense to choose a category from the policy in use. Missing category - This expense hasn’t been categorized. Fix this error by clicking on the expense and choosing a category from the drop down menu. 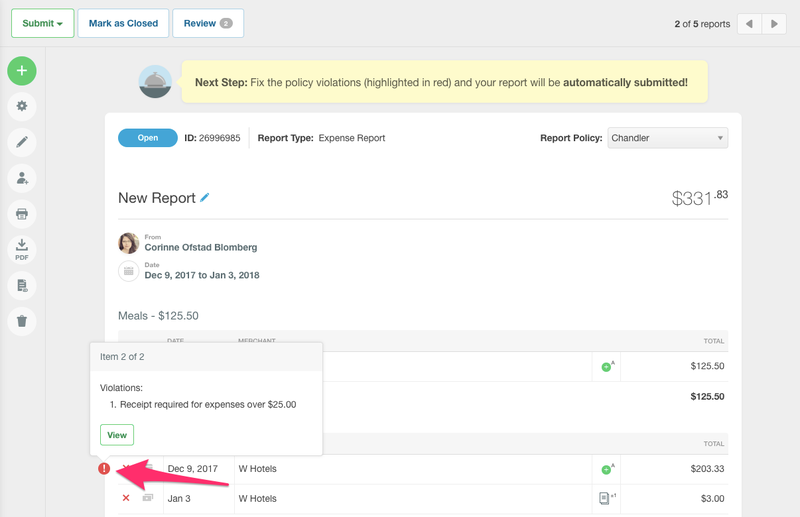 Tag out of policy - The policy you are using to create the report doesn’t have that tag set in it. Either change the policy to the correct one or click on the expense to choose a tag from the policy in use. Missing tag - This expense hasn’t been tagged. Fix this error by clicking on the expense and choosing a tag from the drop down menu. Credit card receipt; Can't auto-match due to a broken bank connection which admin@yourcompany.com needs to fix. Our system is attempting to automatically merge the receipt with the associated bank transaction, but the company-administered card connection is broken. Please contact the person mentioned. Click "Mark as Cash" if this is does not need to match with any card transaction. Credit card receipt; ask "name@email.com" to ignore hold or wait X days and try again. Our system is attempting to automatically merge the receipt with the associated card transaction, but the card transaction has not yet been imported to match the receipt. The person mentioned can "ignore" this violation, or you can wait for the transaction import and merge to complete. Expense date can not be in the future - The expense was incurred at a date ahead of today. You can edit the expense to change the date to show correctly. Expense over X days old - This expense is outside of the date range of the policy settings. You can either remove the expense from the report or ask for an exemption from your manager. Expense over $X - This expense is more than what is allowed by the active policy. You can either remove the expense from the report or ask for an exemption from your manager. Expense over [specific category] daily limit - There has been a specific limit set by your policy admin for this expense's category for this day. Expense over daily limit of $X for [specific category] - There has been a specific limit set by your policy admin for this expense's category for this day. Missing a required tag - One or more of the tags on the expense need are required but have not yet been selected. Missing description- This expense is missing a required description. 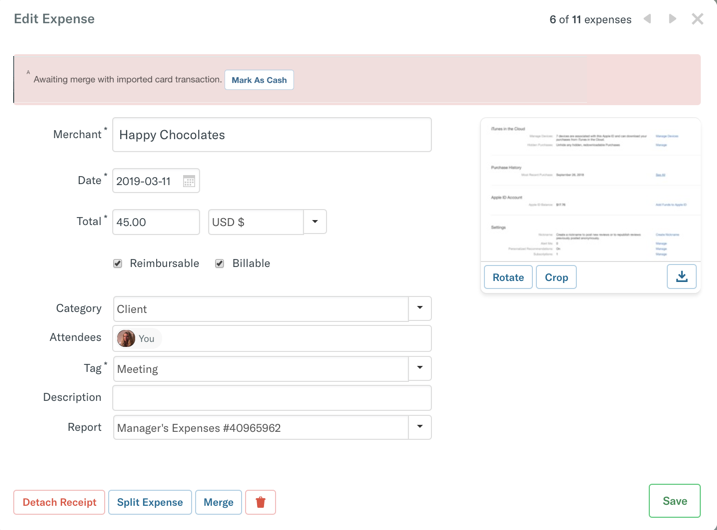 You can simply edit the expense and add a description to remove this violation. Awaiting merge with imported card transaction. This appears when you have a non-reimbursable bank card connected to your account. When this happens, the system wants to auto-merge any receipts with these card expenses. You can either choose to "Mark as Cash" if this is not actually a non-reimbursable card expense to be merged with the card transaction, or delete the card from Account Settings if you are not indeed using this card connection. Expense over X days old - The policy restricts expenses that are over X days old. Please either correct the date, or ask your policy admin how to proceed with this older expense. Potential duplicated expense - It looks like we have an expense with this same date and amount already in the account. Here's how to resolve. Receipt required for expenses over $X - This policy requires receipts to be attached to expenses over a certain amount. 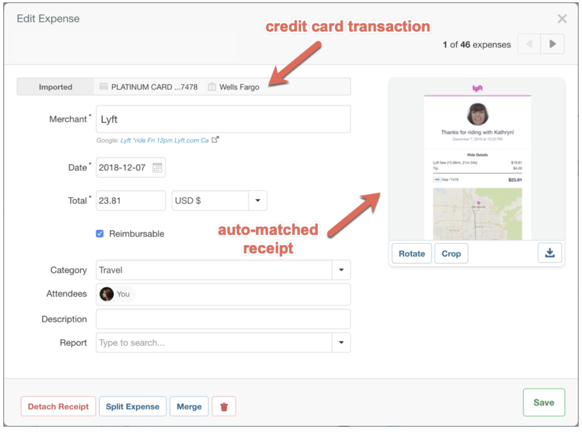 Attach a receipt by clicking the attach receipt button on expenses missing receipts. Receipt required for [specific category] expenses - The category that this expense has been coded with require a receipt. Report fields are required - The report field at the top of the report requires information that has not yet been selected or written. SmartScan failed - We were not able to verify one or more pieces of information on the receipt: the merchant, date, or total amount. Please either manually enter this information or make sure it is clear when trying to SmartScan the receipt again. Tax is out of policy - The tax selected for this expense does not follow the tax allowed on this policy. Tax is required for expenses on this policy - The expense does not have a tax rate selected as required by the policy. Please select the appropriate tax rate. Exceptions to violations will be allowed if the expense includes a Description. With Domain Control, you can enforce Hard Stop Violations that will prevent report submission for all violations. A note is additional information about an expense. This is Concierge's extra little audit process, because sometimes something needs to be brought to your attention even though it doesn't explicitly break policy rules. Notes show additional information about expenses. They give insight into the type of expense and whether it has been edited from the original value. If a note "!" is not displayed for any reason next to an individual expense, you can always check for Notes at the bottom of the report for a list of any Notes that exist in the report, along with the superscript notation that can be matched with that expense. Applied X% conversion surcharge - A currency conversion surcharge was applied when this expense (in a non-policy currency) was created. Conversion surcharges are set by each user in their Account Settings. Cash expense with no receipt - This is a cash transaction that has no receipt attached. Date of expense differs from date read by SmartScan - The date that SmartScan originally read from this transaction has been altered. Expense amount is greater than the credit card import - The value of this expense has increased and no longer matches the amount imported directly from the credit card. Expense amount is X% greater than the receipt amount of Y - The value of this expense has increased and no longer matches the receipt amount. Expense amount is greater than the amount read by SmartScan - The value of this expense has increased and no longer matches the receipt that was read by SmartScan. Tax rate was modified - The tax rate has been changed from the original value. Tax amount was modified - The tax amount has been changed from the original value. The price paid for this booking is significantly below average. Woohoo! This note means that Price to Beat is being used on the policy and that this doesn't appear to be a normal booking average - it may be worth checking the flight details. The difference between this booking and its Price to Beat is higher than average. This note means that Price to Beat is being used on the policy and that this doesn't appear to be a normal booking average - it may be worth checking the flight details. Using the Control company policy, policy violations will always show as "soft warns". Soft warn policy violations mean that when a report is submitted, there will be a dialogue that lets them know each of the violations, but they will still be able to submit a report. You have the ability to make policy violations a hard stop, meaning that if the employee has any policy violations, they will need to correct them before submitting a report. They will not be able to manually submit with these violations, and Scheduled Submit will not automatically submit these expenses either. It is important to note that the hard stop option for policy violations is all-or-nothing. You can’t pick and choose which violations are hard stops and which are soft warns. And you're done! Now users won't be able to submit reports until they are free of policy violations. Our customers who use the ideal flow of importing a credit card and SmartScanning their receipts also take advantage of our great feature that reduces duplicate credit card expenses. To save you time and get you reimbursed as quickly as possible, we will automatically match SmartScanned receipts with your credit card transactions. So, SmartScan, then burn your receipts. We’ll also place a temporary violation on SmartScanned expenses until a viable company card transaction match can be found. The violation will automatically expire after 7 days. As an example, when you first SmartScan any receipt, it creates a cash (reimbursable) expense with the appropriate policy violation. Expensify doesn't know yet if this is a company card expense, but we can assume it may be if you have a company card imported into your account (and assigned by your admin). This banner will notify you so that you are aware that we're still waiting for that transaction to arrive from your bank, stating "Awaiting merge with imported card transaction." Not a company card expense? Click "Mark as Cash" to clear the violation. When the company card transaction is imported, it will automatically merge with that SmartScanned expense by matching the date, amount, and currency of the two. Here is an example of an auto-matched transaction. You'll magically see your SmartScanned receipt become a non-reimbursable expense with the appropriate card transaction, with the card noted at the top of the expense!